In March of 2009, our community lost one of our young people, Abbey, to a drug addiction. The loss has been disheartening. Since this loss, it has become our goal to prevent other friends and families from suffering a similar loss. Abbey’s family and friends have put together a walk to raise funds to be donated to local treatment providers. The money raised is then used to develop resources to help people in our community in overcoming addiction. 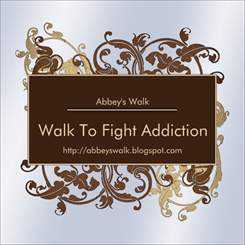 This year, you may choose to walk in memory of someone, or in support of someone dealing with addiction. To participate in this year’s walk click here to register. The walk will be held on the 3rd Saturday of September (Sept. 18th). The walk will begin at 9:00 a.m., and will take place at the Pekin Park Lagoon. There will be a walk fee of $15. $20 if you would like a t-shirt. $5 for window decals. If your community has a campaign that addresses the issue of substance abuse I would encourage you to participate. If you have been touched by substance abuse, please donate your time, resources, and financial support.